Every child should grow up in a safe and supportive environment. Save the Children aims to protect children from exploitation and violence, as well as influence the implementation of children’s rights. There are 18,3-million orphans in the world and as many as eight million children live in children’s homes. Over the last decade, about 20-million children have been forced to flee their homes and over a million children have been orphaned or separated from their parents as a result of disasters. Many survive on the streets or in institutions, in which case they are in danger of becoming victims of exploitation or violence. Others live in homes that are unsafe, or are at risk of exploitation and abuse in their communities. Save the Children emphasizes the development of preventive forms of assistance, so children and their families could receive support at the right time and with high quality. We support the families and caretakers, so that they are able to take better care of the children. We also aim to influence decision-makers and public authorities, so that prevention and early assistance is taken into account in legislation and implementation of legislation. Save the Children is working to keep children safe during disasters and conflicts. In emergencies, we set up safe spaces to help children who have been traumatized by their experiences. We also reunite families separated by war or disaster. Save the Children is strengthening national and local child protection structures in its programs countries to assist children in distress as well as their families. These structures help reduce the vulnerability of children and protect them from all forms of violence and exploitation, as well as from harmful traditions such as child marriages and the genital mutilation of girls. Child protection organizations are helping to cut the risk of children falling victim to child trafficking, dangerous and hazardous work or becoming enlisted in armed groups. Save the Children has been working to protect children, for example, in Somalia and Burkina Faso. Osman is 16 years old who lives with his parents and eight siblings in the Maandeeq settlement. He left school in 2014 due to peer pressure, though he had just passed his class eight exams. 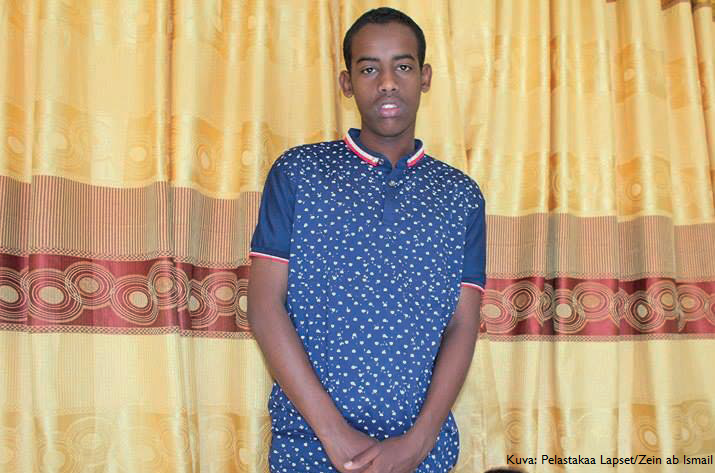 In spite of this, Osman lacked basic knowledge on child rights and the importance of education in one’s life, which in turn made him vulnerable to many negative external elements. Osman took the opportunity to be a member of the Out of School Child Rights Group in the Maandeeq settlement. He participated in a number of child rights awareness-raising sessions undertaken by the Child Welfare Committee. He learned a lot about his rights, including his right to education, and also about how to cope with peer pressure. As a result, he regretted not going to school and wished he had pursued his education. His mother, who had taken part in a Community Conversation, was aware of what her son was going through and his regrets about leaving school. She decided to support Osman by encouraging him to go back to school.